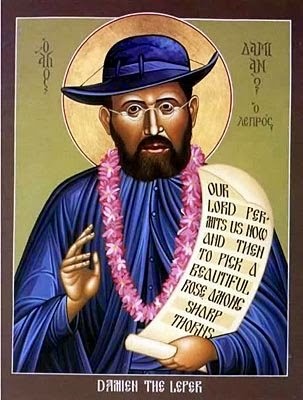 Father Damien of Molokai, ss.cc. was born Josef de Veuster on January 3, 1840 in Tremelo, Belgium. His parents were farmers. His father sent him to a college at Braine-le-Comte. Because of a mission he attended given by the Redemptorists in 1858, Joseph decided to become a religious. He entered the novitiate of the Congregation of the Sacred Hearts of Jesus and Mary, SS.CC. at Louvain, taking the name of Damien in his first vows. Following his brother Auguste, he became a Picpus Brother on October 7, 1860. He took the name Bro. Damianus, after St. Damien, an early Christian saint who performed miracles. On March 19, 1864, Damien arrived in Honolulu in the Kingdom of Hawaii as a missionary still in minor orders. There, Damien was ordained to the priesthood on May 24, 1864 at the Cathedral of Our Lady of Peace, a church built by his religious order, the Congregation of the Sacred Hearts of Jesus and Mary. Fr. Damien was serving at several parishes on the island of Oahu when he became aware of the public health crisis in Hawaii. Many of his parishoners were among the Hawaiians who became afflicted by diseases brought to the islands by Europeans, American and other foreign sailors. Thousands were dying from influenza, syphilis and other ailments that never before affected Hawaiians, esp. leprosy, known today as Hansen's Disease. Hawaiian King Kamehameha IV was afraid leprosy would spread so he segregated the lepers by creating a colony, moving them to an isolated settlement on the island of Molokai. The Board of Health provided them with supplies and food but did not yet have the manpower nor resources to provide proper healthcare to the lepers. Fr Damien was concerned about the care of their souls if they were to be sent to this desolate area, named Kalaupapa, which was surrounded by an impregnable mountain ridge. Fr. Damien's brother was orignally assigned to be missionary to the lepers but he became ill. Fr. believed that the lepers should at least have a priest to tend to their spiritual needs so he volunteered knowing it was a definite death sentence, so he asked his bishop to be sent to Molokai. On May 10, 1873, Fr. Damien arrived at the isolated settlement at Kalaupapa. Bishop Louis Maigret, ss.cc. presented Fr. Damien to the 600 lepers as "one who will be a father to you, and who loves you so much that he does not hesitate to become one of you; to live and die with you." Fr. Damien was sent to a morally deprived, lawless colony of death where people fought each other to survive. The King of Hawaii didn't plan the settlement to be in chaos but he neglected to provide desparately needed resources, which contributed to the confusion and disorganization in the colony. Fr. Damien changed an impossible situation into a colony of life by teaching, painting grass shacks into painted houses, organizing farms and constructing buildings, chapels and roads. He restored faith in his battered and neglected flock. He showed them that despite what the outside world told them, they were precious in the eyes of God. He taught them to believe in God and showed them that by his genuine acts of charity that what there was purpose in their lives. He restored personal pride and dignity among so many who had given up hope. He organized a band, horse riding and choir. Fr. Damien worked providing comfort for the people of Kalaupapa for sixteen years. He was not just their priest, but a builder of homes and their doctor, too. He dressed their ulcers, and tended the sick and dying at their bedsides, bringing them meager portions of taro, fish and water and tried to cheer the despairing with sweets. He built their coffins and dug their graves. He liked praying at the cemetary, “My greatest pleasure is to go there [the cemetery] to say my beads, and meditate on that unending happiness which so many of them are already enjoying.” Fr. grew to love his parishioners as his own children, caring for lepers of all ages, especially for the children segregated in the colony for whom he created an orphanage. "Without the constant presence of our Divine Master upon the altar in my poor chapels, I never could have persevered casting my lot with the afflicted of Molokai; the foreseen consequence of which begins now to appear on my skin and is felt throughout the body." In 1885, he announced, "I am one of you;" he was a leper yet he continued to build hospitals, clinics, and churches, and some six hundred coffins. Fr. Damien had a chance to leave the island if he wanted to. In the spring of 1873 his superiors sent a letter giving him permission to stay, "You may stay as long as your devotion dictates...." He was overjoyed, he had permission to stay where he was and where he longed with all his heart to be with the people he loved. His most controversial accomplishment was to take the plight of his Hawaiian to the world raising money for the much needed improvements he needed to improve the standard of living in the colony gaining support from around the world e.g. Anglicans in England at the disapproval of his superiors. He died April 15, 1889 on his beloved Molokai the age of forty-nine. This is the tomb of St. Damien on Molokai. Father Damien was initially buried in Kalaupapa, but his body was later moved to Tremolo, Belgium. But in 1995, his right hand was returned to Kalaupapa.